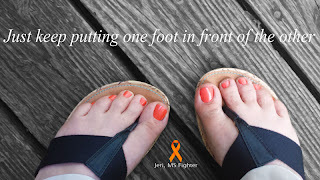 I recall when I was first diagnosed with MS. I spent several years with my back turned toward the truth. I avoided the local MS group as they seemed to be sad and depressing. Lacking hope. I was so fearful of my own uncertain future that part of me just refused to believe I even had MS. It was easier to deny than accept. Facing the truth would mean accepting the fact that I have an incurable, unpredictable, potentially disabling disease. But somewhere along my path, well after my entrance into the TRANSFORMS clinical trial, and even after starting this blog, I became comfortable with facing my disease head on. I believe my experience with Novartis' Go Program and becoming a patient speaker did more for me that I gave back to them. I learned to accept that I do have MS, that it's not the end of the world, and that with my voice I can reach out and make a difference to others who have MS. It wasn't until I overcame my fear of public speaking that I came out of my shell and embraced, albeit reluctantly, health activism. But with the single act of accepting my own MS, for better or worse, I have freed myself and realized a passion I didn't think possible. When opportunity knocked, I went through the door. So that is how my own personal MS motto came about. "Just keep putting one foot in front of the other." Simple, but there's a lot to be said for a pragmatic approach. When I am speaking or writing on the topic of MS or my experience as a clinical trial patient, I have a sense of purpose. You can go a lifetime without ever knowing that feeling, but I have been blessed. Tomorrow is World MS Day 2013, when the whole world joins together to recognize–and spread awareness of–multiple sclerosis. I have been given the opportunity to help raise awareness of MS yet again! www.healthline.com has invited me to participate in a Tweet Chat on the topic of World MS Day 2013. The event will take place live on Twitter at 11 a.m. ET. 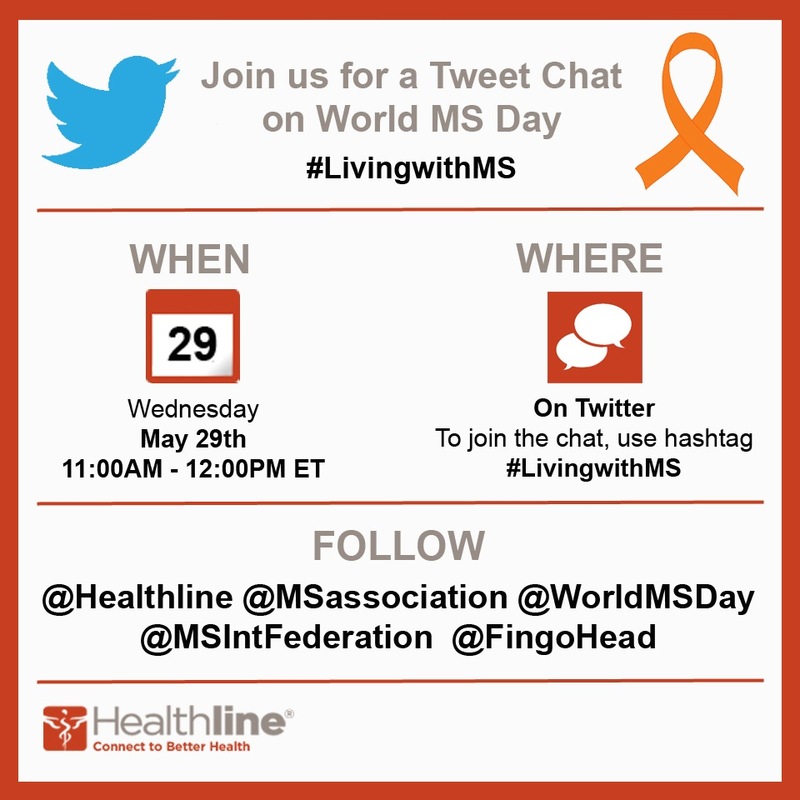 I'm inviting everyone to join in or at least follow along by using hashtag #livingwithMS. It should be an awesome event! I will have the honor of tweeting alongside, Samantha Schech, a Client Service Consultant with the Multiple Sclerosis Association of America (MSAA); Ayesha Ali, Campaigns Manager at MSIF; and Ceri Angood, Director of Programs at MSIF.